Finovate welcomed 64 European leaders of financial technology innovation, all there to showcase their best products and features during the two-day event. "We are extremely proud to be part of building the revolutionary new mBank and we can‘t wait for the reaction of its customers" says Meniga's CEO and Co-Founder Georg Ludviksson. Meniga demonstrated a new mobile feature of its PFM Solution called "To Buy or Not To Buy", designed to inspire people to reduce impulse spending and increase savings. "To Buy or Not to Buy“ combines several core PFM functions, such as "Balance Forecasting“, "Savings Goals“ and "Spending Analysis“ to provide contextual information to consumers when they are about to buy something – and empower them at the point of sale, or point of purchase decision, to make better choices. "Many current PFM offerings fail to achieve significant adoption as they only help people analyze the past – they aren‘t actionable and don‘t help at the point of sale. In sharp contrast, helping people make better financial decisions has always been a key focus of Meniga – and this is precisely what "To Buy or Not to Buy?“ is all about. It is playful and reminds people about their most important goals at the point of purchase decision and therefore reduces impulse spending by offering virtual instant gratification for delaying the gratification of spending money." says Georg Ludviksson, Meniga‘s CEO. Meniga also announced its latest customer at Finovate – BRE Bank in Poland which is working on Europe‘s most ambitious next-generation online banking project with its new mBank, featuring deeply integrated PFM, real-time offers, event-driven CRM, Facebook Integration, P2P Payments, and more. 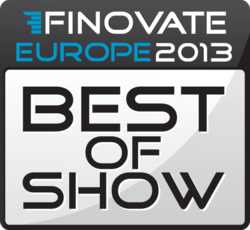 The new mBank was also voted "Best of Show" at Finovate Europe 2013. "When we decided to make it our number one priority to offer our customers the best and most innovative online banking experience available, we had to choose our partners carefully. Our co-operation with Meniga has been exemplary. Not only do they offer a word-class product, they are also fast, professional and exciting to work with." declares Michal Panowicz, head of the new mBank Project at BRE Bank. Founded in 2007, Finovate is a series of unique conferences that showcases the best new innovations in financial and banking technology via short, fast-paced demos (no slides allowed) and high-quality networking. Launched in 2000, mBank is part of the Polish BRE Bank (part of Commerzbank Group). mBank is Central Europe's first direct bank with over 3.5 million customers and the third largest bank in Poland. mBank is engaged in start-up-grade innovation at a massive scale by including a wave of next-generation services as part of the new mBank: transactional banking, real-time event-based marketing, deep PFM integration, social media integration, gamification, video banking, mobility and more. The new Bank 3.0 experience features an innovative transactional site and the first European implementation of transactional marketing, highlighting a creative take on Facebook, social platforms and real-time consumer gratification.